This entry was posted in Meeting Agendas on January 17, 2013 by TCCC Admin. DNR presentation and community discussion on proposed Tundra Isles Subdivision began at 5:30 pm and continued until 7:50 pm. Following, the meeting was called to order. Board Members Present: Glenka, Miller, Kolbeck, Leo. 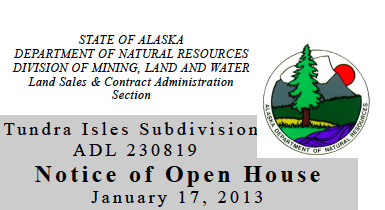 Kathryn Young, Section Manager of the Land Sales & Contract Administration Section (LSCAS) Division of Mining, Land and Water with the Alaska Dept. of Natural Resources; John Thomas, LSCAS; and their crew. Mayor DeVilbiss, and numerous community members. Minutes from December’s meeting read and unanimously approved. Utility Tractor – The John Deere 1026R utility tractor with all the implements is at Craig Taylor Equipment undergoing presale testing. Several parts for the snow blower and blade attachments are still on order. 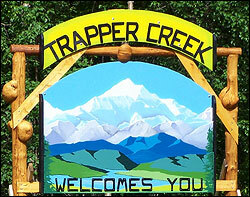 ETA in Trapper Creek is at the end of January. 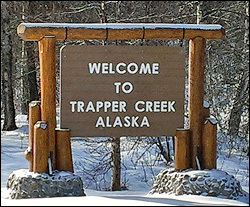 Welcome Sign North – The funds appropriated to the builder have been deposit into an account established at the local Credit Union. No further action is to be reported to date. Motion made by Glenka to remove Shawn Stankowitz as authorized signor on MVFCU bank account. Motion second by Kolbeck. Motion made by Glenka to add Ralph Kolbeck as signor on account. Motion second by Levi Miller. Glenka to remain as signor. All in favor. Date of next meeting scheduled for February 21 at 6:30 pm. This entry was posted in Meeting Minutes on January 17, 2013 by TCCC Admin. The proposed preliminary decision (PD) to offer for sale State-owned land for private ownership in classified Settlement lands around the Petersville Road area. Get more information on the Tundra Isles page. This entry was posted in Issues on January 13, 2013 by Ravensong.